Do you have those old air conditioners in your apartment? It is time for removal of those old air conditioning units in Singapore. There are a couple of reasons behind aircon removal service for your consideration. However, the most important reason to get those old broken air conditioners removed is for hygiene purpose. Let’s do a quick review whether this is a valid reason to get rid of those old broken air con. Many people do not know why their young or old ones getting sick now and then without any reason. Most of the time they missed look on the dust mites that got accumulated in our house. They cleaned every spot but forgot about the old unused air con. There are many construction and industrial sites around the area we live. They are producing dust or debris in their work process every time. These dust or debris are light powder form and can travel in kilometres by wind. The worst about them is that these dust or debris are too small to be seen by naked eyes. They settled almost everywhere like the old unused air conditioner. Through time, they piled up and created a living habitat for dust mites. When these dust mites get into people’s respiration system, the weak ones will get ill. If some people wondered why not get those old broken air con fixed and used again, it is actually quite impossible. Most of those old air conditioners comes to the end of their manufacturing lifecycle and their air con spare parts got ceased in production. Some of those old air conditioners got salvage parts from scrap and worked till their end without any part replacement. They eventually worn out or do not produce cool air. It gets more difficult and expensive to find old aircon parts. If broken aircon left to accumulate dust and debris, the hygiene problem gets into people’s health. 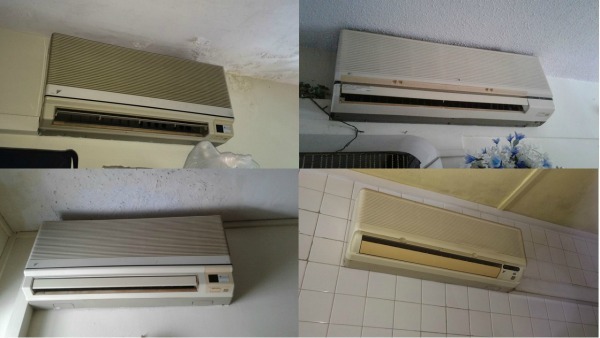 We would recommend to have those old broken aircon removed to eliminate this hygiene issue.